TUCSON, Ariz. - Oct. 3, 2017 - PRLog -- Before he became an award-winning space historian and science journalist, Robert Zimmerman wrote a riveting science fiction novel, PIONEER, about humanity's first contact with aliens, set two hundred years in the future. Though it was written more than three decades ago, the book remains amazingly authentic in its portrayal of the future settlement of the solar system, based on what has happened the last decades of 20th century as well as the exciting emergence of a private commercial space industry now in the early 21st century. That book has now at last been published. The year is 2183. Fifty-six-year-old Saunders Maxwell is a stubborn old space-farer who has spent his entire life in space. He has commanded the Moon-Mars shuttle and led exploration missions beyond Mars. Later he turned to asteroid mining, captaining a small ship and crew on repeated trips to the asteroid belt, bringing back minerals or even small asteroids to sell so that the Mars colony could harvest them for the needed resources. As he and his pilot Harry Nickerson fly over the vast slopes of the giant volcano Olympus Mons on their way home from one such mining mission, Maxwell spots a strange glint below, a glint that is not natural and should not be there. When they land they discover something entirely unexpected and impossible, the body of man who had disappeared on a distant asteroid almost a half century before. Sanford Addiono had been on one of the first manned missions to the asteroid belt when he and a partner had vanished. Nothing was ever heard from them again. Even more baffling, two later missions to that asteroid found that it had disappeared as well, no longer in orbit where it was supposed to be. Now, 46 years later, Maxwell finds Addiono's body on the surface of Mars. 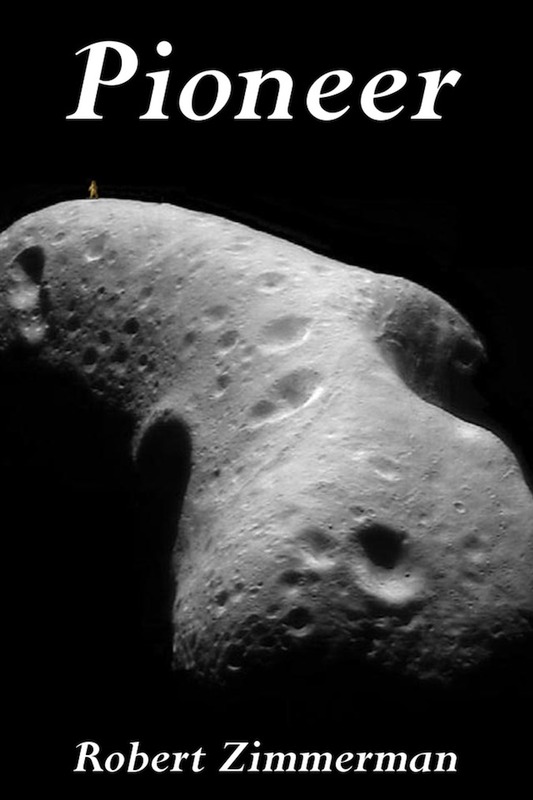 How Addiono had gotten to Mars from a distant lost asteroid--without a spaceship--was baffling. That riddle was magnified by what Addiono had brought back with him. Among his effects was a six-fingered robot hand that had clearly been made by some alien civilization, along with a recorder and memo book describing what Addiono had seen. Here was a mystery that would rock humanity, the first alien contact. And at that moment Saunders Maxwell decides that he is going to be the person to solve that mystery, even if it takes him through hell and back. Robert Zimmerman is an award-winning science journalist and historian who has written five books and innumerable articles on science, engineering, and the history of space exploration and technology for ASTRONOMY, AIR & SPACE, SCIENCE, NATURAL HISTORY, THE WALL STREET JOURNAL, USA TODAY, WIRED, INVENTION & TECHNOLOGY and a host of other publications. He also reports on space and science news at his website, BehindtheBlack.com (http://behindtheblack.com). His classic book, GENESIS, THE STORY OF APOLLO 8 (Mountain Lake Press: http://behindtheblack.com/books/genesis-the-story-of-apollo-8/), describes the epic family and political tale behind the first manned mission to another world. It remains a steady bestseller twenty years after its first publication. In addition to his writing, Mr. Zimmerman is also a cave explorer and cartographer, and has participated in numerous projects exploring and mapping previously unknown caves across the United States. It is this activity that has allowed him to actually "go where no one has gone before," thus providing him a better understanding of the perspective of the future space explorers on Mars and beyond as they struggle to push the limits of human existence.